Ah, spring break in the Bahamas. Sun. Sand. Palm trees. Snorkeling in coral reefs. Exploring limestone formations. Visiting the town dump. What? Wait. The town dump? Yes, Deep Creek Town Dump to be precise. 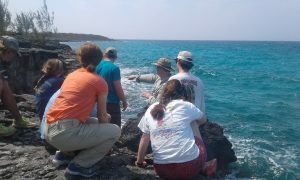 For more than 20 years, Dr. Brian Bodenbender has had a penchant for teaching and researching coastal geology in the Bahamas, and the weather there has nothing to do with it. It’s all about the rocks, the sea and sustainability for Bodenbender, who has led more than 70 students to the Caribbean nation over the years. 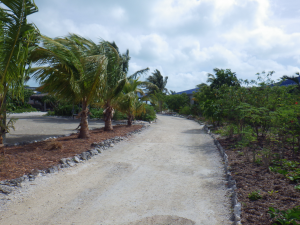 Along with showing off the geological and biological features of Eleuthera Island, Bodenbender also teaches about how sustainability efforts are, or are not, successful in a remote place where dependence upon natural resources is obvious every minute of every day. Eleuthera’s main industry is tourism, but many of its residents also rely on fishing and some agriculture, mostly mixed crops on small plots, for their living. On an island that is long (approximately 100 miles) and thin (six miles at its widest part), all 8,000 Eleutherans depend on having 90 percent of their food imported which results in 100 percent of the waste remaining on the island. Thus the stop at the town dump. What Eleutherans do with that waste is one of Bodenbender’s lessons. He feels it’s worth teaching in a place that is both a tropical paradise for tourists and also a permanent residence for thousands. 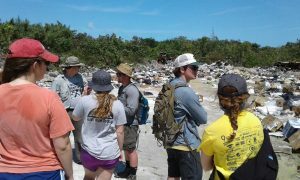 Open-air incineration in paradise is an issue in and of itself, but the students also learn that the composition of Eleuthera’s bedrock creates another problem when it comes to burning trash. Since the island is mostly composed of limestone with little topsoil, the porous nature of the ground means that rainwater percolates through the dump’s ashen toxins right down into the groundwater and that toxic tea eventually reaches the ocean. Junior geology major Jacob Stid agrees and actually sees a connection between what he now knows of waste disposal on Eleuthera and waste disposal in the U.S. It’s not a favorable connection, though, for his home country. Bodenbender says Eleuthera is not without good sustainability efforts. And, he does show his students their successes, such as the making of biodiesel fuel from used cooking oil retrieved from cruise ships, as well as producing excess wind and solar energy that goes right back to the Bahamian government’s power grid. Those sustainability priorities are potential money-savers for the tiny island; waste disposal is anything but. 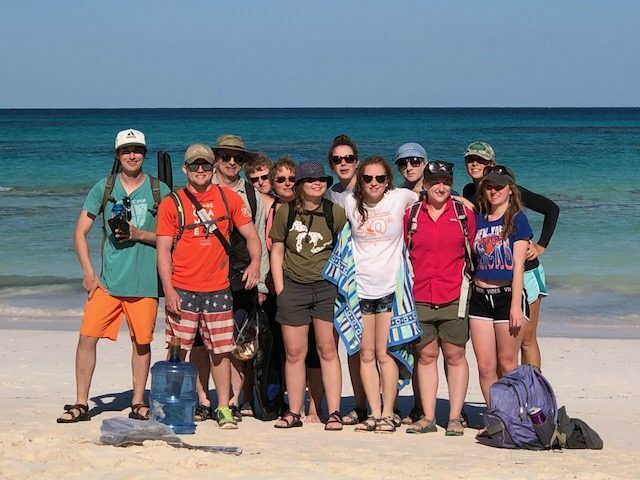 Prior to departing for their intensive spring break lessons on Eleuthera, students meet once a week with Bodenbender for this semester-long course to learn how to identify certain invertebrates and geological features they’d encounter on the island while there for eight days. 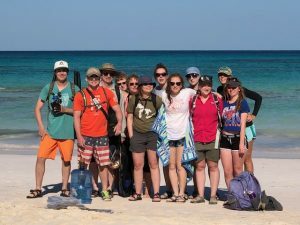 Besides their sustainability excursions, the class also took day hikes in the island’s tropical forests and along its rocky coast, and went snorkeling to investigate coral reef degradation and rebirth. Bodenbender headquartered his class at the Island School in Deep Creek — a private secondary school on the island that also is home to graduate-level research — for both living and teaching accommodations. After each exhausting day out learning on the island, class members would debrief at the school and write in journals. Now back at Hope, each student is turning their journal into a field guide of Eleuthera as well as writing a reflective paper on sustainability. 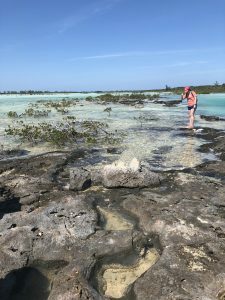 For senior biology major Kristin Godwin, this course was an opportunity of a lifetime, and it deepened her understanding of the interdisciplinary scientific nature of the Bahamas. 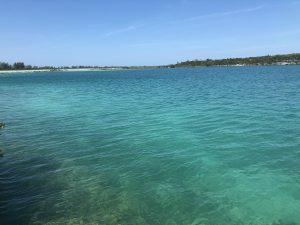 While she believes she’ll forever remember the indescribable, show-off-blue water and sky on Eleuthera, and that small fish that swam under her for protection as she snorkeled reef to reef, Godwin was also impressed by the complexities and challenges of sustainability in the Bahamas and at home.